To start new players off right, ITV Bingo offers £10 worth of free play following registration and the funding of an account with an initial deposit of £10. Those who wish to start off with more than £10 in their account will get a 100% matching bonus up to a maximum value of £150. ITV began broadcasting in Britain in 1955, making it the oldest commercial television network in the U.K. The ITV Network ranks as the number one rival to the BBC for viewing audiences. The media conglomerate’s latest foray on the Internet has been a venture with Cashcade Limited—the world’s leading marketer of online gaming, specialising in bingo and casino games—which coincidentally operates an online casino news portal. Now the partnership has produced ITV Bingo, a new online bingo service where players can participate in cash bingo games, chat with fellow bingo fans, and catch up on some of their favourite ITV shows via the ITV Player installed on the web site. The games here are powered by Brigend and 888 software from Cassava Enterprises, licensed in Gibraltar. English is the main language, the British pound is the primary currency, and no download is necessary to wager and play. At any given time, there are 100 or more players logged on to ITV Bingo, taking advantage of the non-stop action in its bingo rooms. Most popular is the traditional 90-ball version, with payouts for the classic one-line, two-line and full house winners. The 75-ball games feature patterns and reward the first two players to complete them. To keep things interesting, there is a progressive jackpot in the 90-ball room that currently stands at £184.64. It just keeps getting bigger with every game played. When someone catches a Bingo in 44 calls or less, this special jackpot will be claimed on top of the normal game jackpot. In addition to these games, ITV Bingo offers a broad selection of side games, from multi line slots and 3-line slots to casino table games, keno and instant win games. Many of these are based upon popular ITV shows, such as the X-Factor game. Of course, there are lots of moderated chat games, too, with hundreds of bingo points up for grabs in the chat rooms. Chat hosts are happy to provide all of the details as the start new contests every few minutes, every day of the week. To be eligible to participate, players must be funded and holding a minimum of one active bingo card. As players receive extra money with every subsequent deposit of at least £10. Deposited amounts are matched at a rate of 50%, up to a limit of £100. It should be noted that deposits of as little as £5 may be made, but only those of £10 or more are eligible for the free matching cash. Withdrawals may be made in amounts of £30 or greater. 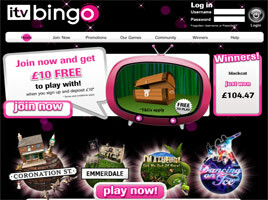 To reward player loyalty, ITV Bingo has a scheme based on Bingo Point (BPs). Points can be earned for every card purchased and every friend referred, as well as in chat games, weekly specials, or tournament play. Every set of 1,000 BPs earned is worth £1, and the points may be easily redeemed from the Loyalty Section of the My Account page, where a Redeem Points button appears. Although BPs may not be exchanged for cash, they can be applied to the cost of tickets, just the same as using real money. Also on the My Account page is a Refer a Friend option that ca be used to invite friends to play at ITV Bingo. Every friend referred earns the player an extra £5 Bonus Cash to use on purchasing bingo cards. To qualify, persons who are referred must be 18 years of age or older and resident in the U.K.
Other promotions at ITV Bingo include guaranteed jackpots of £100 daily and £1,000 on Fridays at the 9pm £1 90-ball game. Every Saturday, a 40-inch LCD television is given away in the Mega Game Room as the top prize in the 50pm game at 9pm. And winners of each day’s free “I’m A Celebrity...Get Me Out Of Here!” Bushtucker Trial game receive not only a mystery number of BPs, but also drawing entries for a chance to win a holiday to Australia for two.